...based on the design of an aircraft hangar. 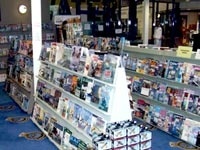 ...there is also a museum souvenir and gift shop to ensure our visitors enjoy and remember their stay. The Museum boasts a 6000m2 two storey exhibition centre, souvenir shop, function centre, theatre and airfield viewing platform. The Museum is open seven days a week except for New Year's Day, Good Friday, Easter Monday, Christmas and Boxing Days. Pre-booked guided tours are also available for bus groups at no extra cost. The museum's verandah overlooks the historic airfield at HMAS Albatross which has variously served the RAAF, the USAAC, the Royal Navy, the RNZAF and the RAN since it was established in 1941. Developed from a small collection of naval aviation relics and five obsolete RAN aircraft by a very energetic team of Navy volunteers originally established in 1974, the museum has grown to be the largest regional aviation museum in NSW now containing over 30 aircraft and numerous aviation artifacts to relay the story of Naval Aviation and the development of the Royal Australian Navy's Fleet Air Arm. The Navy team worked harder during the 1980s to raise funds for the construction of a large hangar, function centre and shop and over $8m was raised through corporate donors, private donors and from material in kind from building companies. It was a superb effort which resulted in an excellent facility that now stands in testament to the vision and energy of a dedicated group and the generosity and community mindedness of the donors. Much is owed to RADM Andrew Robertson AO, DSC, CDRE John Goble and other very highly motivated people to bring about such remarkable results. The Australian Naval Aviation Museum Foundation was formed on 6 June 1990 to operate the Museum and fulfil an ambitious charter largely related to relaying the story of Australian Naval aviation. The collection was broadened in 2000, adding objectives related to aviation history in Australia and renaming the institution as Australia's Museum of Flight to recognise the change. The aviation display hall was reconfigured, displays were upgraded and the museum was unveiled by the Chief of Navy VADM CA Ritchie AO on 17 December 2003, the 100th Anniversary of the Wright Bros first flight. While the institution's name was changed in 2001 - to Australia's Museum of Flight - the ANAMF maintained an abiding interest in commemorating, collecting, preserving, and interpreting Australia's proud naval aviation heritage. On the 1st September 2006 the Chief of Navy, VADM RE Shalders AO, CSC, RAN accepted ownership and management of the Museum on behalf of the Royal Australian Navy, announcing it's new name as the Fleet Air Arm Museum. The Fleet Air Arm Museum has drawn resource support from corporate, private and government assistance as well as from a volunteer program. An enthusiastic team of volunteers maintains the Museum and contributes significantly to its operations. Donations of appropriate assets to the collection qualify for Taxation Incentives for the Arts Scheme, which means that an aircraft or aviation artefact at say a valuation of $100,000 by two independent valuers, could net approximately 50% of that amount as a taxation deduction. The aviation collection covers Australian Naval aviation history and other military aviation. Volunteers are drawn mostly from the local community and former Navy personnel. Teams work on aircraft and display maintenance and on administrative tasks and in the archives. We are always looking for more help from people who can make a commitment to join the teams on a regular basis. If you are interested in becoming part of this team please contact the Museum on (02) 4424 1920. 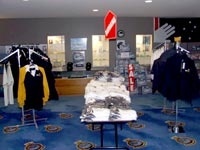 Fleet Air Arm Museum shop. When you visit the Fleet Air Arm Museum (FAAM), please take a moment to visit our souvenir shop. The Fleet Air Arm Museum shop boasts a vast array of Navy and aviation related merchandise and mementos for sale. Top quality aircraft models, clothing, headwear, souvenirs, books, DVDs, toys and gifts are all for sale at affordable prices. If you can't make it into the shop we invite you to visit SALT. Here you can shop for an exciting and comprehensive array of unique items such as memorabilia, gifts, promotional and public relations products. All items can be badged to suit your individual, company, team, club or association needs. The FAAM shop and the SALT web site are managed by the Royal Australian Navy Central Canteens Fund (RANCCF) and all profits are used to provide welfare and recreational benefits for sailors. Nowra aerodrome has already been used by the RAAF in operations with the Navy and there seems no doubt that had Adastra [Airways] not gone to some trouble and expense to induce the local authorities to prepare an aerodrome at Nowra, the Commonwealth would have been obliged to prepare at its own expense an aerodrome in this locality for service purposes. The Shoalhaven and adjoining south coast regions have long played an important part in the country's aviation development. It was at Stanwell Tops just north of Wollongong that the aviation pioneer Lawrence Hargrave conducted his influential box kite experiments in the late nineteenth century, and it from nearby Seven Mile Beach that Charles Kingsford Smith departed in 1933 - in the Southern Cross - to establish the first commercial aerial link with New Zealand. It was the fledgling airline industry that first recognised the Shoalhaven's aviation potential and caused the infrastructure developments that later served the military so well. In May 1935, Adastra Airways Ltd inaugurated a same day Sydney to Bega (NSW) return airmail service stopping enroute at Nowra. Adastra's Fox Moth and Waco biplanes maintained this twice weekly subsidised service until about September 1940 when its aircraft were impressed by the military. Britain, Australia and the United States conducted aerial operations from this site throughout the Second World War, and nearby at St Georges Basin and Jervis Bay. The Navy's Fleet Air Arm has been operating from this site since 1948 with many of the region's residents still having some association with this activity. Fleet Air Arm personnel were taught aircraft ground handling techniques using obsolete Mk V and Mk VIII RAAF Spitfires, at least fifteen of which were transferred to the RAN's new Naval Air Station at HMAS Albatross after June 1948. Aircraft Handlers were instructed on a narrow expanse of concrete known as the dummy deck which was dimensionally similar to the flight deck of Australia's first aircraft carrier HMAS Sydney (III) and, which now forms part of this museum's floor. Original line markings can still be distinguished in some parts of the museum. Conservation is an important aspect of the Fleet Air Arm Museum and the museums collection management program. The care of our collection is central to our work here at the museum. Our conservation plan helps us to provide a framework for establishing and maintaining appropriate standards of collection care and for setting priorities for our conservation work. We apply two types of conservation here at the Fleet Air Arm Museum; preventative and interventive. Preventative conservation is about ensuring that our collection is stored, displayed, handled and maintained in a way which does not lead to deterioration or damage. This includes testing materials, environmental monitoring such as light and humidity levels, collection assessment and pest monitoring and control. Interventive conservation is about repairing damage or decay through investigation, cleaning, stabilising, restoring and recording. The first successful 'heavier-than-air' flights by the American Wright brothers in December 1903 lead to the commonplace use of aircraft in military and naval service during the First World War. Three RAN cruisers served with the Royal Navy in the North Sea during World War I, and by 1918 these ships each carried a Royal Navy Air Service Sopwith fighter capable of being launched from a wooden platform constructed over a main gun turret. Once airborne, these aircraft had to land ashore, or 'ditch' near a friendly ship. In 1929, Navy commissioned HMAS Albatross (I); a 6000 ton seaplane carrier built at Cockatoo Island in Sydney and designed to carry nine RAAF Walrus III aircraft. Initially, cranes handled the aircraft, but later a launching catapult was fitted at the ship's bow. These aircraft had RAAF pilots and maintainers and Navy Observers and Telegraphist/Air Gunners. By the start of World War II the RAN cruisers Australia (II), Canberra (I), Sydney (II), Perth (I) and Hobart (I), were all equipped with catapults and RAAF Seagull V amphibians. The two Armed Merchant Cruisers Manoora (I) and Westralia (I) also carried Seagull V's. In late 1945 LCDR Victor Smith RAN, an Observer with wartime service in the Royal Navy's Fleet Air Arm, was sent to Great Britain to plan the establishment of a Fleet Air Arm for the Royal Australian Navy. The success and growth of naval aviation during World War II made apparent a need for an Australian Fleet Air Arm. The character of naval warfare had changed and the aircraft carrier was now an essential part of any modern navy. In April 1944 the Australian Prime Minister John Curtin, approached the British Prime Minister Winston Churchill for England's help to establish a Fleet Air Arm. The British Prime Minister was eager to accommodate. The process was initially thwarted by a lack of naval manpower, political indecision and financial bickering. Finally in July 1947 the Commonwealth Defence Council approved the formation of the Fleet Air Arm under the control of the Royal Australian Navy. Prime Minister Ben Chifley approved the acquisition of two light fleet carriers from the UK and in August cabinet approval was given for the light fleet carriers, two naval air stations and three air groups. In April 1948 King George VI approved the names Sydney (III) and Melbourne (II) for the carriers and Albatross for the RAN Air Station at Nowra. HMAS Sydney (III) arrived in Australian waters in May 1949, with the 20th Carrier Air Group. After returning from England with the 21st Carrier Air Group Sydney (III) and her Squadrons was deployed in late 1951 to operate as part of the United Nations Forces opposing the invasion of South Korea. Sydney (III) was deployed a second time in 1953 to monitor the Korean armistice. The commissioning of HMAS Melbourne (II) with her angled flight deck, steam catapult and mirror assisted landing system, heralded the introduction of pure jet and turboprop aircraft into the Navy's Fleet Air Arm. Melbourne (II) arrived in Australia in May 1956, carrying De Havilland Sea Venom FAW Mk 53 fighters and Fairey Gannet AS1/4 Anti-submarine aircraft. The Sea Venom was a purely jet propelled aircraft, powered by a de Havilland Ghost turbojet engine. The Gannet, although a propeller aircraft was powered by a Double Mamba turboprop engine (basically two Mamba gas turbine engines placed side by side each driving one of two co-axial contra-rotating airscrews). The Sea Venom replaced the Hawker Sea Fury Mk 11 and the Gannet replaced the Fairey Firefly AS-6 in their respective roles. The Sea Venom was a very advanced aircraft for the time. Its radar, operated by the Observer, allowed for all weather operations, the first Australian military aircraft to do so. The ungainly looking Gannet achieved a reputation for being somewhat temperamental but it was one of the most advanced turboprop designs of its day and proved to be an excellent anti-submarine aircraft. In the years leading up to the half-life modernisation refit of HMAS Melbourne (II) in 1967, much debate took place at Defence and Federal Cabinet level over the aircraft types to replace the now outdated Sea Venom jet fighters and Gannet anti-submarine turboprops. Eventually the decision was for Navy to acquire ten new Douglas A-4G Skyhawk fighter/ bombers and fourteen Grumman S-2E Tracker anti-submarine aircraft from the USA. This potent fixed wing element, combined with the upgraded Westland Wessex Mk 31B ASW helicopters heralded a frenetic period of activity for the Fleet Air Arm. In terms of payload capability in the case of the A-4, and wingspan of the S-2, these were the largest aircraft that could be operated from Melbourne (II) and landing them was exciting to say the least. The US Navy operated the same aircraft from carriers four times the size of Melbourne (II). By 1968 the composition of the Naval air squadrons was at its highest number ever, with front line and second line Tracker, Skyhawk and Wessex squadrons as well as 723 Squadron operating Bell Iroquois and Westland Scout helicopters in the training and utility role. The front-line ASW helicopter force was further enhanced in 1975 with the arrival of ten British built Westland Sea King Mk 50s. The Bell Kiowa 206B-1 also supplemented the existing training and utility helicopters. Also during the 1970s ten more Skyhawks were added to the fighter squadrons and sixteen replacement S-2G Trackers were purchased following the loss of nine of the original S-2Es in a hangar fire at HMAS Albatross. The Federal Government decision not to replace Melbourne (II) when she decommissioned in 1982 meant the age of Navy fixed wing aviation at sea was over. The decision to establish a military air base at Nowra was made soon after World War II was declared in 1939. The Royal Australian Air Force occupied the new base in May 1942, followed shortly by the US Army Air Corps and the Royal Netherlands East Indies Air Force. The base was considered ideal for naval aviation due to its proximity to Jervis Bay. In 1945 the Royal Navy deployed its aircraft from the British Pacific Fleet carriers to the Nowra Base to what was then called HMS Nabbington. In July 1947, the Commonwealth Defence Council approved the formation of the RAN Fleet Air Arm. HMAS Albatross (RAN Air Station - Nowra) was commissioned on 31 August 1948 and became the home of the Fleet Air Arm. Growing from a group of World War II temporary huts, Albatross has been Navy's primary land base for the training and maintenance of its Squadrons since 1948. HMAS Nirimba at Quaker's Hill, NSW was commissioned from 1953 to 1954 as a second Naval Air Station and air technical training school. Navy aircrew training was always been and remains demanding, the operating environment is unforgiving. To land an A-4 on HMAS Melbourne (II) or a Seahawk on the pitching deck of a frigate requires great skill and lots and lots of practice. Much of the training to build these skills was and is still conducted at Albatross and over time many a trainee pilot has often heard the words 'Go around again' from their instructor. The concrete floor of this Museum was originally the 'Dummy Deck' simulating a carrier flight-deck for aircraft handling, spotting and ranging practice. During 1966, the increased intensity of the war in Vietnam caused the US Forces to request further military support from Australia, particularly helicopter crews and associated maintenance personnel. Australia had just committed a third Army Battalion to service in Vietnam and this would increase demand for airmobile support from US sources. Navy offered some aircrew and maintenance personnel to be drawn mostly from 817 Squadron based at Nowra. This was refined to eight pilots, four observers and 40 aviation maintenance personnel from all categories. It was eventually decided that this group would integrate with the US Army's 135th Assault Helicopter Company (AHC). The new unit arrived in Vietnam in September 1967. The 135th would be equipped with 25 new UH-1H troop carriers and 8 UH1-C armed attack helicopters. The team formed up at Nowra in September 1967 with the unit name of the RAN Helicopter Flight Vietnam (RANHFV) and joined 723 Squadron for pre-deployment training on UH-1B Iroquois aircraft. After a month of intensive training with assistance from the Australian Army, the RANHFV joined the 135th AHC in Vietnam in early October. Aircrew and maintenance personnel infused into the Company's structure according to rank and category. This first group of the RANHFV was to be deployed for one year, to be relieved by a second group in October 1968. Four groups were eventually deployed with the 135th from 1967 until 1971. The unit lost five aircrew, killed in action, over the period. HMAS Melbourne (II) decommissioned in 1982. Both 805 and 816 Squadrons were disbanded and their Skyhawk and Tracker fixed wing aircraft were offered for disposal. The Macchi trainers of 724 Squadron were transferred to the RAAF, but 724 continued to operate with a reduced number of Skyhawks. 851 Squadron continued to operate Trackers but by 30 June 1984 the two last fixed wing squadrons were disbanded. The operating philosophy for naval aviation in the RAN shifted from aircraft carriers to frigates and support vessels operating helicopters. Navy commissioned its first Guided Missile Frigate (FFG) in 1980. These ships were capable of carrying two medium helicopters and interim trials continued through the late 1980s with Bell 206 and Squirrel rotary wing aircraft. Naval aviation again took a quantum leap in 1989 with the delivery of the S-70B-2 Seahawk anti-submarine helicopter. The Seahawks and utility Squirrels were quickly pressed into active service aboard FFGs and other support ships during the 1990/91 Gulf War. Navy deployments to enforce UN sanctions against Iraq were maintained through the 1990s. The first of the Anzac Class frigates commissioned in 1996 and they were also equipped with Seahawks of 816 Squadron. The Anzac Class frigates and their Seahawk Flights have had a continued presence in the Gulf region, including the 2003 Iraq War. The Sea King utility helicopters of 817 Squadron saw active service in East Timor and the Persian Gulf and served in numerous other operational areas including Somalia, Bougainville and the Solomon Islands. 817 Squadron disbanded in 2011 and 808 Squadron formed in 2013 with the MRH-90 helicopter. The Museum is located on the New South Wales South Coast, 2½ hours drive from both Sydney and Canberra. 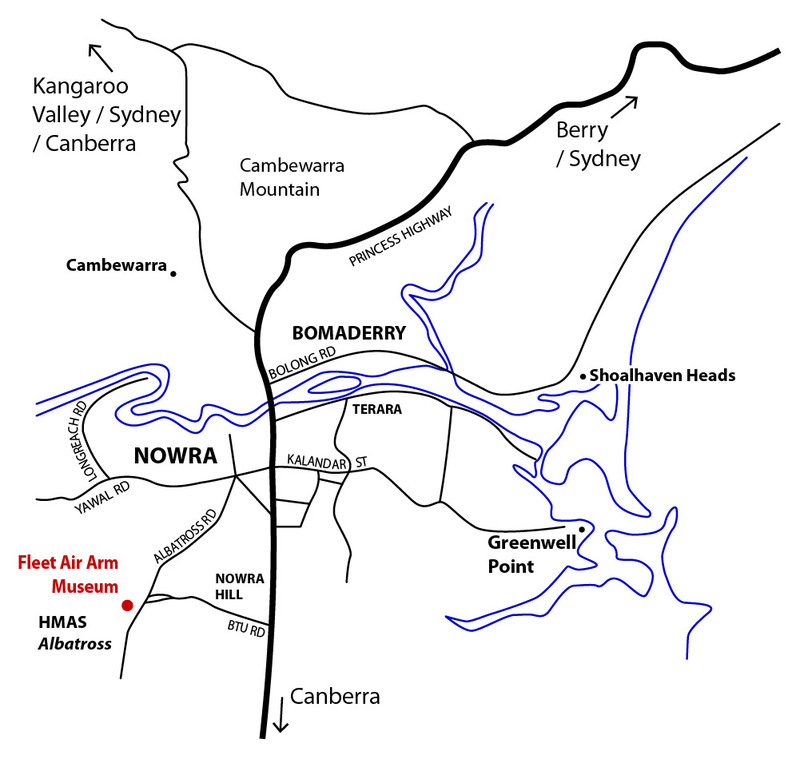 Regular train services operate between Sydney Central and Bomaderry (just north of Nowra) however, there are no connecting services - other than taxi - between Bomaderry and the Museum. Our address is 489A Albatross Road which runs south-west from Nowra, and becomes Kalandar Street that intersects with the Princes Highway. Should you miss this intersection - easy enough - while heading south on the highway, then carry on down through South Nowra's industrial precinct until you reach the Museum signposts at the BTU Road intersection (on your right) on the town's southern outskirts. Civilian aircraft can, with prior approval, also land at HMAS Albatross. Approval details can be found in En Route Supplements (ERSA). Additional directions and maps are available from Google Maps.